Hi guys! Happy birthday to 2pm's maknae Chansung! And congratulations to Wooyoung on his solo concert! Khun and other members were present to support him and our appa is wearing a mickey shirt! Brings back memories! [02/12/18: Vic Studio Weibo Update] The Chinese New Year is coming. Hope you a safe trip back home and a nice gathering with your family. Sadly Jun.K will not be joining them because of the recent accident Still happy to see these guys together again on stage! Sporting the same style as always! "2018 Happy new year ^^"
"Be healthy all year long and hwaiting! Let’s be happy!" "2018 Happy new year ♥"
"2018 Happy new year ♥ MeU"
Very supportive mother our Vic eomma got there! They are as close as ever even though we haven't seen them for a long time. Why didn’t you answer my phone call? 왜 내전화 안받았어요? Hi everyone!!! Not sure if you still remember me coz it's been ages since I last posted here on our beloved thread! I'm so sorry I weren't able to update at all. Finally, I graduated in med school and now I'm on my internship preparing for the board exam so there goes why I've been so busy. By the way a million thanks to @Elle1997 @pucca_chan @snixxNKV for still posting once in a while. I don't know if you are still visiting the thread but if you do I hope you read my post. I can't promise anything but rest assured I'm still and will always be a Khuntorian even though I rarely got the opportunity to visit here. Hope you are all doing fine! 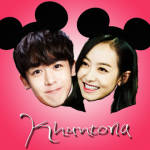 Khuntoria forever! HEEYYYY OF COURSE I STILL REMEMBER YOU! Happy to see these guys together on stage again! 18/02/18 Song Qian strikes a candid pose in new photos posted by her studio. I 100% agree to this. They are so unique you can't compare them to anything.